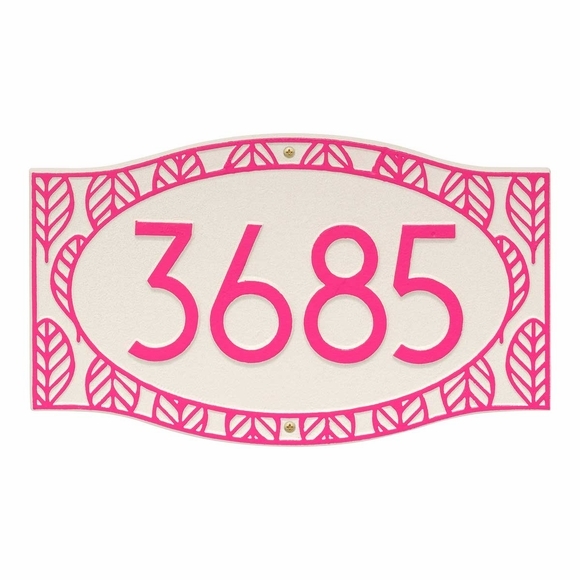 Tropical Style House Number Custom Address Plaque - - one line wall plaque with tropical appeal. Personalized with the house number you supply and the color combination you select. Custom made in the USA. Inspired by the leaf of a palm or fern, the detailed fronds on this plaque invoke the breezy feeling of a beautiful beach or coastal location. Palm fronds are a quintessential symbol of the tropics and have been a staple in design since the 1940's. Alumi-Shield™ all weather coating protects against the harshest weather and environmental elements. Extends product life and helps maintain the original look of your address sign. Personalization and frond accents are permanently cast into the sign. House number line holds up to four (4) 4" Modern font characters. Stucco with magenta characters is shown in the large image. Seven more colors are shown from left to right in small images: BV bronze verdigris; C8 dazzling blue with white characters; C9 scuba blue with white characters; DW dark blue with white characters; M1 white with aruba blue characters; OG bronze with gold characters; and WH white with black characters. The remaining colors are shown on the color chart (small image on far right). Includes mounting hardware and instructions. Dimensions: 15.25"W x 9.125"H x 0.25". A two-line version of this sign is also available. Click top link in Related Products. House number shown in images: 3685.